You'll really love these easy banana cake recipes. These cakes are so moist. My favorite is Mom's banana walnut cake with its tangy lemon icing! Get a bunch of ripe bananas and make yourself a delicious homemade treat. Spoil yourself by relaxing with a true comfort food to end the busy day. By the way, be sure to watch the delightful little video beneath the recipes. If you're my age, it's sure to bring back memories of simpler times. Ingredients: 1/2 cup shortening, 1 cup sugar, 2 eggs, 2-1/4 cups flour, 1/8 teaspoon soda, 2 teaspoons baking powder, 1/2 teaspoon salt, 1/4 cup milk, 1 cup mashed bananas, 1 cup whipping cream, 2 banana sliced. Method: Cream shortening and sugar. Add beaten eggs, then sifted dry ingredients alternately with the sweet milk. Beat in the mashed bananas (2 to 3 put through a sieve). Bake in two 8-inch layers in moderately hot oven (375°F) for 30 minutes. When cool, put the layers together with sweetened whipped cream and sliced bananas. Top with whipped cream. Mom often made this cake. I especially liked the chewy walnuts and the sweet, tangy icing. It's one of the banana nut cake recipes that she got from Grandma. And the banana icing recipe makes a rich, delicious frosting that may be used to top almost any white cake. Cream 1/2 cup butter, blend in 1 cup white sugar and cream until fluffy; combine with 1 egg beaten, add 1 cup mashed bananas (3 medium-sized bananas). Sift and measure 2 cups flour; resift with 1 teaspoon baking soda, 1-1/2 teaspoons cinnamon, 1/2 teaspoon salt. Coat with flour 1 cup broken walnuts. Add walnuts and sifted dry ingredients to first mixture with 1/2 cup sour milk, 2 teaspoons vanilla. Bake 1 hour in 8 x 8-inch pan. 1/2 cup mashed banana, 1 tablespoon lemon juice, 2 tablespoons soft butter, 4 cups icing sugar. Mix the banana, lemon juice and butter, and work in the sugar until icing is of spreading consistency. One-half cup shortening, 2 eggs, 1 cup mashed bananas, 2 teaspoons baking powder, 1 cup white sugar, 4 tablespoons sour milk, 2 cups flour, 1 teaspoon soda, 1 teaspoon salt, 4 teaspoons vanilla. Mix as ordinary cake, and bake in moderate oven for 30 minutes. This may easily be turned into a delicious applesauce cake recipe simply by substituting applesauce and mixed spices for the bananas. I find one cup of applesauce is a real good substitute for the bananas, along with 1/2 teaspoon mixed spices. One cup granulated sugar, 1/4 cup butter, 2 eggs (1 white kept for icing), 1/4 cup sour milk, 1 teaspoon soda, 2 teaspoons baking powder, 2 cups flour, a little salt, 3 very ripe bananas. Cream sugar, butter and egg yolks. Mash and beat the bananas until smooth and add to the mixture. Add the sour milk and soda then the flour, into which the baking powder and salt have been sifted. Lastly, fold in the well-beaten egg white. This easy banana layer cake recipe makes a classic three layer cake with a delicious banana filling. If you're searching for a delicious banana dessert to serve, this is it! Ingredients: 1/4 cupful of butter, 1 cupful of sugar, 2/3 cupful of water, 2 cupfuls of flour, 2 rounding teaspoonfuls of baking powder, whites of four eggs. Method: Put together the same as ice cream cake (i.e., cream the butter, adding slowly the sugar; sift the flour with the baking powder; add the water and flour alternately to the sugar mixture, and beat well; fold in the well-beaten whites), and bake in three layers. When cold, put together with Banana Filling. Boil together one cupful of sugar and a half cupful of water until they spin a heavy thread, and pour slowly, beating all the while, into the well-beaten whites of two eggs. Beat until rather stiff and cold. 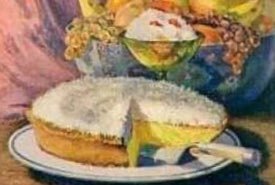 When the cakes are cold, spread one-third of this filling over one cake, cover with thin slices of red bananas, put on another cake, on this another third of filling and bananas, and the remaining cake; cover this with the remaining filling, and dust thickly with chopped nuts. Do not let this stand too long, or the filling will absorb moisture from the bananas and run down the cake. 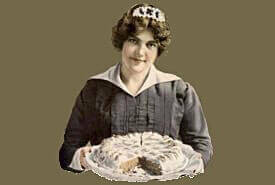 Fredericka of Rome, NY writes, "I am searching for a chocolate banana cake recipe called Gorilla's Banana Cake. I think I found it in a small magazine like Home Cooking years ago. It was moist and had chocolate chips in it. It didn't need frosting. Would love to find it again." You can easily make a simple banana cake from almost any white cake recipe with the help of this simple cake filling once used by White House chefs. Make an icing of the whites of two eggs and one cup and a half of powdered sugar. Spread this on the layers, and then cover thickly and entirely with bananas sliced thin or chopped fine. This cake may be flavored with vanilla. The top should be simply frosted. A rich, cream cheese frosting for a 9x5 inch cake is easily made by creaming together 8 ounces of cream cheese, 1/4 cup butter, 2 cups icing sugar, and 1 teaspoon vanilla flavoring. Chill until ready to serve. There's no getting around it, the easy banana cake recipes on this page ARE easy to make. 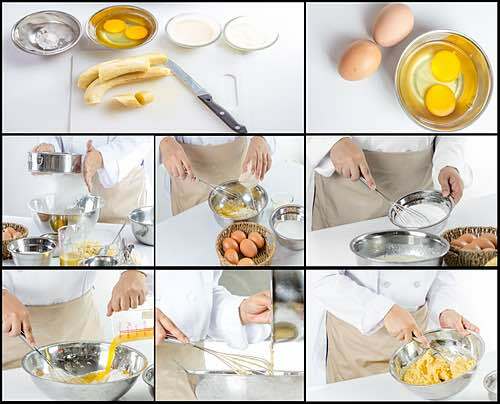 As the steps in the above image show, simply assemble the ingredients, add them to your bowl, mix thoroughly, and then pour the batter into a buttered cake pan and bake until done. That's it. Why not bake one today? Did you know that recipes for banana cakes and breads were largely unknown in home kitchens until the end of the 19th century? A combination of unreliable shipping methods and a lack of refrigerated freight cars prevented the widespread use of bananas in home cooking before this time. Only food stores and restaurants in the major cities had access to bananas regularly. 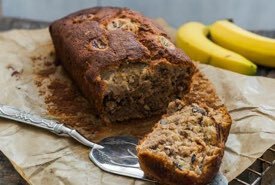 By the 1920s, though, banana cakes had become common, and they became especially popular in the 1930s when enterprising grocers often provided their customers with free recipes in an attempt to sell the overripe bananas. Sometimes stores could hardly keep up with the demand as the popularity of the tropical fruit increased. Do You Remember Miss Chiquita? 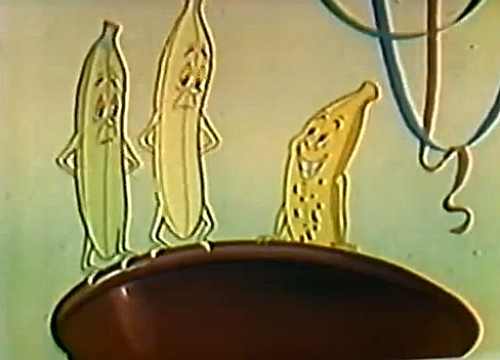 The catchy Chiquita® Banana jingle was created in the 1940s to introduce bananas to movie goers and to educate people on how to cook with them. 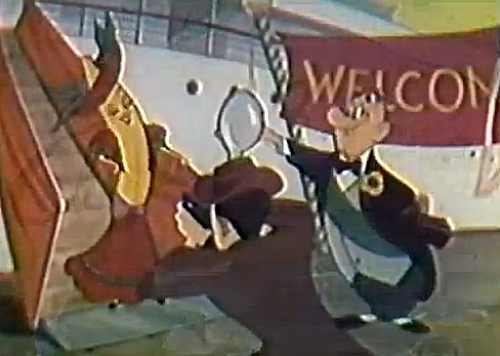 I can recall seeing it in a local movie theater in the mid 1950s. "Bananas have to ripen in a certain way — When they're flecked with brown and have a golden hue — Bananas taste the best and are the best for you." "But, bananas like the climate of the very, very tropical equator — So you should never put bananas in the refrigerator." 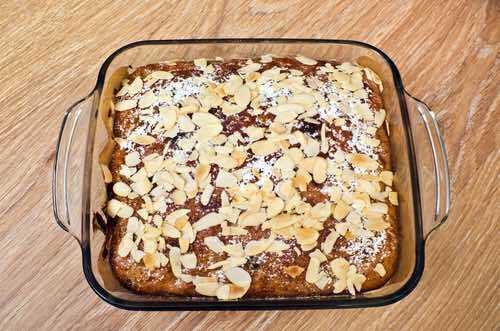 It wasn't long before everyone caught on that making the easy banana cake recipes from scratch offered an delicious way to make use of overripe fruit. So why not make some today?